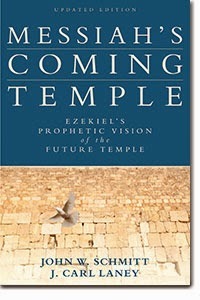 John W. Schmitt and J. Carl Laney, Messiah’s Coming Temple: Ezekiel’s Prophetic Vision of the Future Temple, 2nd ed. (Grand Rapids: Kregel, 2014). I was excited to receive a copy of the second edition of Messiah’s Coming Temple: Ezekiel’s Prophetic Vision of the Future Temple by John W. Schmitt and J. Carl Laney in the mail. I remember working my way through this original edition in seminary. It was the most comprehensive examination of Ezekiel’s temple that I had read and I have yet to encounter anything to surpass it. The original edition was published in 1997. This second edition does not include a new forward so I am not sure how much has changed. The publisher notes that, “this newly expanded work [is] based on extensive research and discussions with leading Jewish leaders and rabbis in the United States and Israel.” But this is rather vague. I can say that the original edition’s 192 pages has been expanded to 248 (not 224 as noted by Kregel) and that there are three new chapters: Ezekiel’s Temple and Archaeology, Predictions of a Different Temple, and Can Sacrifices Be Part of a Future Temple? There are also more figures/maps (from 15 to 22), photographs (from 10 to 11), and the addition of six charts. Although I have only had the opportunity to scan through this updated edition, everything that I have seen so far indicates that it remains the go-to resource for studying Ezekiel’s temple.